THE LUAS SERVICE will operate tomorrow on St Patrick’s Day. Spokespersons for both sides this afternoon said that the tram service will operate and that the strike was called off. Talks between Siptu and Transdev at the Workplace Relations Commission lasted for 28 hours before agreement was made. Proposals around pay have been accepted by three of the four grades involved in the dispute, including drivers. “Revenue protection officers, revenue protection supervisors and drivers will now consider the proposals in relation to their grade and vote on them in the coming days,” said Siptu’s John Murphy. Speaking to RTÉ, Siptu divisional organiser Owen Reidy said that “substantial progress” had been made in the talks between staff and management. “I think the important thing to note is that the trams will be running tomorrow,” said Reidy. We’ve reached conclusive discussions with three of the grades… and we’ve reached a place with the drivers where at this moment in time the proposals with the Workplace Relations Commission is in their view… the best that can be achieved in negotiations. We’ve deferred and suspended the work to rule and deferred the action tomorrow. He said that Siptu members would be balloted next week and that the final decision on whether to accept the deal would come down to them. Agreement has not yet been reached on traffic supervisor grade but Murphy said Siptu is “hopeful a resolution can be achieved”. Transdev managing director Gerry Madden said that he was delighted that there would be no strike tomorrow. “There’s still some work to be done,” he said. I would say that there’s still some issues that need to be ironed out… but I’d be confident that we can move those forward. The two sides had been locked in discussions with Workplace Relations Commission chief Kieran Mulvey since yesterday morning. In a gesture aimed at breaking the impasse in the row, Luas operator Transdev confirmed on Monday night that it would scrap a plan to bring in buses to cover services for the national holiday. The plan had been slammed as ‘scab labour’ by supporters of the striking drivers. That move paved the way for the drivers to rejoin the pay talks along with the other three grades of tram service workers yesterday morning. Email “Pay deal sees St Patrick's Day Luas strike called off at last minute”. 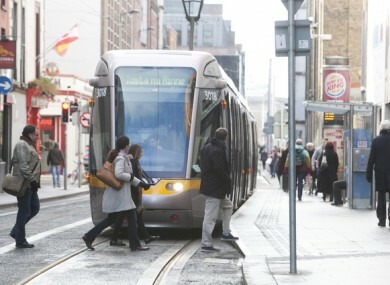 Feedback on “Pay deal sees St Patrick's Day Luas strike called off at last minute”.